Can this truck really be worth more than a Ferrari or Lamborghini? The Mercedes G-Class is an ideal SUV for any celebrity who wants to arrive in style, even though this is very far from the SUV's military roots. The latest G-Class is filled with luxury seats that massage you, and Mercedes keeps giving the car more power with crazy AMG versions. The six-wheeled AMG 6X6 was the pinnacle of the G-Wagon's lunacy, and prices reached nearly $1 million. Mercedes knew that there needed to be something a little less extreme than the 6X6, which is why it built the 4X4 Squared. Mercedes will offer the G550 4X4 Squared in the US, and those who want the incredible off-road machine will need to dish over a check for around $200,000. However, if that SUV's 4.0-liter twin-turbo V8 with 416 hp and 450 lb-ft of torque isn't enough, Brabus does a version called the G500 which brings the output up to 493 hp and 523 lb-ft of torque. This seems like a nice upgrade, but we recently found a different Brabus-tuned G-Class which could be even better. It is called the B63S G700 4x4, and to own it someone will need to shell out $499,750. The car is being sold by RMR 4X4 in Alabama, and we were curious to find out what made this G-Wagon worth the large price. For starters, this model is the first of its kind in North America and is one of only three in the world. Mercedes has stopped Brabus from making more than three of these cars, so it will stay incredibly rare. The B63S may look like the 4X4 Squared, but it is actually based on the G63 AMG. The tuning company worked closely with Mercedes for six months to equip the G63 with parts from the 4X4 Squared, including a central tire inflation system. 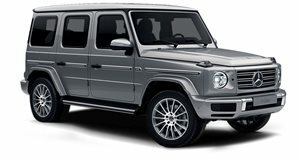 However, because it is based on the G63, it has options that the 4X4 and 6X6 do not have, such as adaptive cruise control and a rear-view camera. The B63S also has the G63's 5.5-liter twin-turbo engine which has been tuned to produce 700 hp. From the exterior, the B63S seems to resemble the 4X4 Squared, albeit with more carbon fiber trim pieces. These pieces give the truck an expensive look, although we would constantly be worried about ruining them if we ever took it off-roading. The interior appears to be the same as a G63, but that is to be expected. The biggest question is whether this rare Brabus is really worth more than twice as much as a standard 4X4 Squared. For starters, the B63S is incredibly rare, but we are sure that the 4X4 won't be a high-production vehicle that will be spotted on every Beverly Hills street corner. So is the power worth the extra cash? This Brabus-tuned G-Class does have almost 300 more horsepower than the 4.0-liter V8 in the 4X4 Squared, but at the cost of around $300,000. We would never argue that horsepower isn't fantastic, but in such a heavy car that isn't exactly known for its straight line performance, we just aren't sure that the added power is necessary. What we have here is the perfect example of what makes the G-Wagon great. There are plenty of boring crossovers and SUVs that cost a fraction of what a G-Wagon does, but Mercedes continues to build it anyway. No one really "needs" a G-Wagon, let a lone one with AMG power. That is why we love the G-Wagon, because it shows that cars do not always need to be logical. If every car purchase was made based on logic then some of the world's greatest automotive creations wouldn't exist. While we would certainly be fine with a standard G-Class, we commend anyone who would buy this incredible Brabus B63S.